Update, August 23 at 2:26 p.m. ET: Mashable has cast some doubt on the veracity of these leaked LG V40 ThinQ renders from MySmartPrice. It says the side renders look like they show a dual vertical camera bulge on the back, rather than the triple horizontal camera that is shown directly on the rear render. Also, the previous cameras in this LG series, the V30 and V35, have noticeable antenna lines on the top, which is not shown on the leaked V40 render. 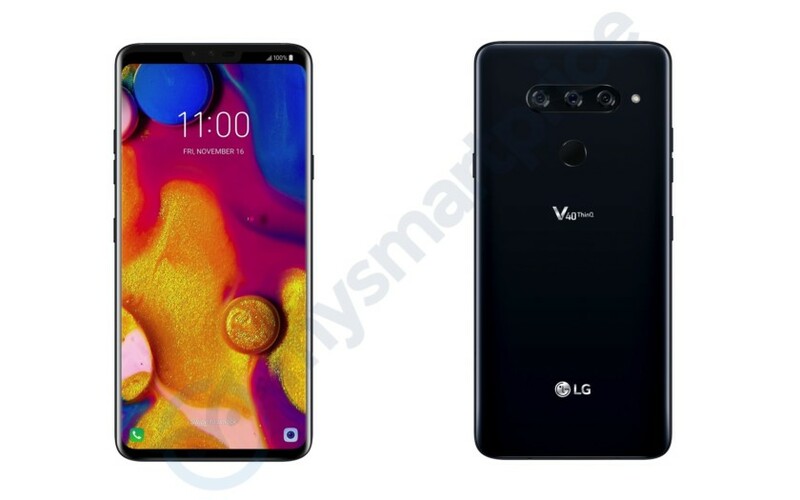 Finally, the buttons on the side of the V40 render look more like the buttons on the LG G7 than the V30 and V35. As always with these kinds of “leaks,” you should take these reports with an appropriate grain of salt until we get an official announcement from LG. Original article, August 22 at 1:39 p.m. ET: We’re likely more than a month away from the official launch of the LG V40 ThinQ but we’ve already got some leaked images (via MySmartPrice) that give us an idea of what to expect with LG’s next flagship. The leaked images appear to be press renders. Since they are renders only, take these images with a grain of salt, as renders are pretty easy to fake. With that said, the design of the device as depicted in these images matches up pretty well with established rumors, so they likely are legitimate. If you just gave a quick glance you might have gotten excited because it appears the LG V40 ThinQ doesn’t have a notch. However, if you look closely you’ll see that it does, it’s just that the status bar is black which effectively “hides” the notch. We saw this design on the LG G7 ThinQ earlier this year. Thankfully, the notch is pretty small if you decide not to hide it, and the small chin of the device gives the whole thing a very premium look. If you look even closer at the notch, you’ll see what appears to be two camera lenses. It’s possible that these work in tandem together like a dual camera setup on the rear would, but it’s also possible that one of the lenses is for photos and the other is an IR sensor for face unlock technology. We can’t be certain yet. On the bottom of the phone, you’ll see a speaker grille, a USB Type-C port, and the oft-removed 3.55mm headphone jack. Previous LG devices make a big to-do about audio capabilities, so the inclusion of the headphone jack was pretty much guaranteed, but these renders will likely set many LG fans more at ease. On the sides of the device, you’ll see the usual power button on the right and the volume rocker on the left. Beneath the rocker, you’ll see what is most likely the dedicated Google Assistant button. Finally, on the back, you’ll notice one of the biggest upgrades the device is likely getting: a triple-lens camera. If the two lenses on the front work together for shots that will put the number of lenses on the LG V40 ThinQ at five, which will likely make it the first phone to market with that many lenses. However, if that second sensor on the front is not a camera lens, the device will have four lenses just like the Huawei P20 Pro, the first phone to market with a triple rear camera. We expect LG to formally announce the LG V40 ThinQ in September for October launches around the world. However, that’s a rumor at this point, so we could see things earlier or later. But at some point this year, you’ll be able to get your hands on this device. What do you think? Do these renders have you excited? Let us know in the comments! NEXT: Is this the LG V40 ThinQ firmware? Or is it something else entirely?